See all of our Gun Broker auctions click box above or CLICK HERE. 1.) Payment: If you are the winning bidder, you will receive payment instructions in a confirmation email when the auction ends. 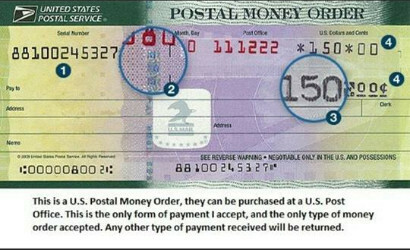 We accept USPS MONEY ORDER ONLY for firearms sold on Gun Broker. WE WILL NOT ACCEPT CREDIT CARDS on firearms sold on Gun Broker. side of Gun Broker unless it is sold locally through our shop. Do not ask. 2.) Federal Firearms License (FFL): We must ship all firearms to a verified FFL holder. We do not ship to C&R holders. Your confirmation email will include our mailing address we do not have a fax number. Include your name and the auction number in every correspondence. If you have any concerns, please contact us at sales@mainegundealer.com and we will be glad to assist you. We do not ship to ALASKA & HAWAII. When paying by Money Order, please send the final bid amount plus shipping (Maine residents include 5.5% sales tax). Firearms will only be shipped to a federally licensed firearms dealer. Maine residents may pickup your firearm directly from our retail store, located at 681 Bog Road Hermon, Maine. We DO NOT ship to C&R License Holders. Some firearms are not legal in every state. Check your local laws before bidding. We can ship ­blackpowder guns to your residential location, if they are legal in your area. We offer optional shipping insurance at a rate of $1 per $100 of the item value; e.g. a $400 item would insure for $4.00. We are not responsible for merchandise lost or damaged in shipping, if item is not insured. NEW: All new guns are warranted by their respective manufacturers ONLY. Unless noted otherwise, the new guns we sell are BRAND NEW IN BOX and HAVE FULL MANUFACTURERS WARRANTIES. We will work with each customer to ensure they are able to take advantage of the manufacturers warranty, but we do not warranty the guns ourselves. USED: All used guns are sold as is with no returns accepted. Like any used firearm they should be taken to a certified gunsmith for inspection before firing. Purchasers of used firearms are urged to contact the manufacture for a firearm owners manual for such firearm if not included. Layaway: We do not offer layaway on Gun Broker items. We only offer layaway to retail customers. Do not ask. Buy - Trade: We buy and trade locally only. We do not accept any kind of trade via the internet or through Gun Broker. Do not ask. Selling outside of Gun Broker: We do not sell anything outside of Gun Broker unless it is sold locally through our shop with buy it now price if offered. Do not ask.